the best video about David!!! 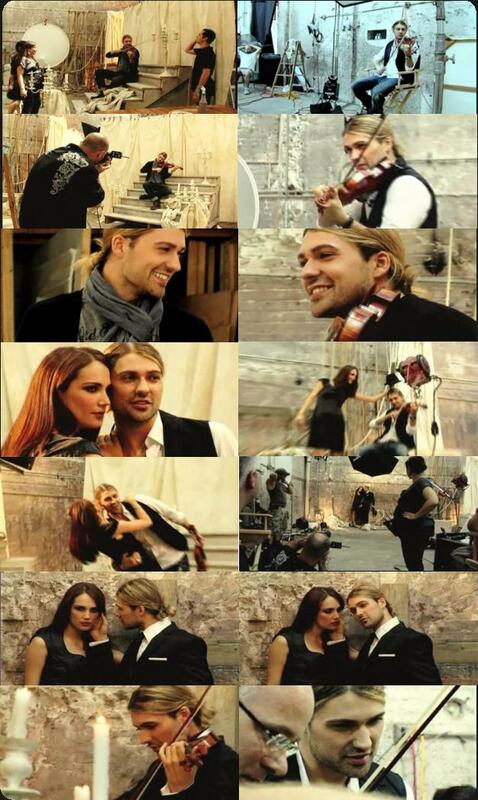 David Garrett, a virtuoso on the violin, a life for the music! Everyone who sees me on stage, know that I'm actually a limelight hog and have an incredible amount of fun. These are the moments where you really forget everything. Even when things are not currently doing so well, you live for that. You are on stage, look at the audience, see them moving and having a good time. I mean, that really is a great profession if you can take people to such an emotional journey ... and that makes me happy. Sold out concerts, gold and platinum awards for his albums and numerous awards - David Garrett is already a superstar in Germany. The son of an American ballet dancer and a German lawyer now wants to try his breakthrough in America. We have now done 14 concerts in the U.S., this morning we arrived from Atlanta, 6 hours on the plane and then I relaxed a bit in the afternoon, a little sleep, a little practicing - yes, let’s go. Near the legendary Hollywood Boulevard, the 29-year old perfomes in Los Angeles for the first time. On the programm, an intense sound check and rehearsal with his band. But David can hardly concentrate, he has forgotten his lucky charm in the taxi. What about your hat? Clarified that? I just called them, they will get it to me. I first said I spend $ 100 for those who bring it back and then it went very quickly. This is the United States. Is this a special hat? I have it for so many years, I've forgotten it everywhere and found it everywhere, so a bit of a lucky charm. Music is something intense, personal, close to his heart for David. I am my own worst critic, there are people coming to me after the concert, praise me but I know exactly that I can do better. You learn it in so many years, even as a child . To notice mistakes on stage, save them and constructively make it better. Even without the hat David must get familiar with the sound in the concert hall. Not much time left for him. In a few hours he has to play with his band in front of 2000 people - then finally the lucky charm taxi. Musician and hat are reunited. Casual look, cool clothes, rock star attitude, the fans know and love him. His charisma captivating, his looks stunning, his playing virtuously. More than 100 concerts the German-Americans performs in one year, with a mix of classical, rock and pop, The native of Aachen has conquered the music world. He is familiar to a life with the violin since his early childhood. I can not remember a time where I have not played the violin, so it seems I have started very early. I know that my brother has played violin before. I can remember a time, when he practiced the same things I did. But David is the more ambitious students. I have always been a person of ambition and wanted to prove to my parents that the toy was given to the wrong one. Aged 10, he made his concert debut with the prestigious Hamburg Philharmonic, the recording contract with the Gramophone followed 3 years later. David - The prodigy of this time. Menuhin, Isaac Stern, Ida Haendel, don’t spent their time if there is no talent. And they took care of me a lot and tried hard to let me learn from them and this at a very early age . This means, the talent had been there very early of course, but you also have to see the work you are doing for many, many years. And this is probably the hardest time, between I would say 8 and 16. David's childhood was marked by his musical talent. That was a very stressful time for everyone involved, including my parents, there was nothing beside school than work, prepare for concerts, play concerts, travelling, auditions in front of people. You feel the certain expectations of your parents, who naturally want the best for you - which of course is a career and that is not always fair to the child, but that's how it is. I have a very quick question, these 2 cent coin, you have the one from 1864? Yes, I'm looking for it for already 2 years. The 10 year old lives an unusual life. As a child he is a maverick and nerd in school. Despite or perhaps because of his success. It was quite obvious that I played the violin and it was usual to twit me, because it was something which was not done by everybody in school and you always look for the extraordinary and use it against the person . Today, from the coin collector and a loner he turned into a celebrated musician, who is still playing classical concerts, but now lives out his passion for the rock the stage. With his crossover style David wants to attract young people for classical music and his concerts. A gentle music education the rocking way. But something is wrong with the sound of the violin in Los Angeles. A bit difficult today, because we had little time to do the sound check and the guys just started half an hour ago. Bit difficult here on stage as you can’t hear much of the violin through the small monitors during the harder pieces, but I will get it right. If they in the hall hear good, I don’t have to. I still have the violin at my ear and hear something. After 20 years on stage, he stays relaxed in case of such problems. David's musical experience is also appreciated by his musicians. In Germany it is already at the top. The accolade - an invitation to one of the most successful Saturday evening shows. Thomas Gottschalk: "It's nice that everyone brings his own implement.You can sit next to Nazan ....... Have you dutifully brought your violin, because you tell me, O God, I am not working or do you really love that instrument and you say, I don’t go out of the house without? David: "So let's say, it's very considerable story to be here at “Wetten dass..” I have already watched it as a child and this is really.....yes, you are a bit excited, but the violin helps. "Wetten that...! Is still somehow THE show....on German TV, insofar it was a challenge to be invited....and I was of course incredibly happy when it finally happened. But television shows and concerts are not the only part of David’s working life. Today he is looking for a new violin. Yes, this is not what you want to have for a Beethoven Violin Concerto, these are not instruments suitable for a solo-concert, but these are quite good violins and I am looking for one especially for outdoor-concerts, which sounds good but is not worth a Million. His Stradivari and Guadagnini are worth a Million and these violins still cost a small fortune. If you are lucky to look for a violin you can orientate yourself on what you listen to in yourself and look for that. You have an imagination about the sound, the color of the tone a piece should have. You can do a lot with the sound of an instrument if you are a good violinist. But I would say, if you are an excellent violinist and have got the instrument which matches with you, this is obviously the perfect combination. Here, he will not get a violin, but he has gained a new fan. In the evening, David is meeting his 3 year older brother Alexander, who works in New York as a lawyer. "If there is anything that bothers me, or what concerns me, or if I am unhappy, my brother is really the first instance I call, and he always finds the right words to put things in the right perspective and is rebuilding me again. This is very, very important in my life. Yes, as a child you sometimes have a row, but there was a mutual understanding, that we must stick together and we kept it until now. Not only a close relationship, but also a good dose of humor connects those two disparate brothers. My brother can do everything better than I , except playing violin. He is more a person of mind, everything must somehow make a sense. I am a bit more of an emotional person. If something is not ok, I somtimes lose patience and then I am very emotional. You are a bit more controlled, something I admire a lot. Alexander has witnessed David’s continuous desire to become better since childhood. Alex: "When I look at my brother, what he has achieved, is is very good, excellent. You have witnessed how hard he had worked for it, it’s not that you can say it came from nothing. He travelled a lot, with many teachers, has performed concerts, nothing to be upset that he was successful, you were happy everything was so successful for him. Are proud of your brother? Alex: Of course, but it has less to do with music, CDs and all the other trappings. It is more the pride of him as a person, that he is here. David: This is ..... please stop. At age 17, David lives in an elitist world, is successful, travels around the globe. At the peak of his musical career he chooses, however, a radical break. I practically ran in this situation for years and came to a deadlock, even in a musically way. It was confusing. I did not know who does what, and why and above all I did not know why I am doing something. I wanted to start from zero and have had the courage to say: I don’t want to deal with the past any more. You have to have a lot of courage to say, I don’t want to deal with the good and bad things. He leaves the predetermined path of the record company and his parents, cancels all his concert dates, renounced honor, money and recognition. He breaks with everything and has no idea what the future brings. New York is the new center of his life and is his home until now. New York is a kind of sancturay for me – a haven, where I like to spend time, because I can forget everything around me. Every time I arrive in New York and sit in the taxi and drive over to the city and see the skyline, I still have butterflies in my stomach. And I think as long as that remains, that you are so happy to be back in town, I will stay here. He remains loyal to his music, even after his departure from Germany about 10 years ago. He applied at one of the most renowned music conservatories. The Juilliard School. Studied music and composition. I totally didn’t care what people told about my playing. In that moment it was important for me: Do I like what I am doing? Is it something I am in love with? To carry out a profession for many years you are not in love with, is somehow a punishment. Insofar, in that moment, the only thing, which was important for me was , that I have fun, that I am satisfied with what I do and anything else I didn’t care. The exact opposite of my childhood.